Sleep plays a vital role in good health and well-being. Getting enough quality sleep can help protect your mental health, physical health and quality of life. Sleep plays a vital role in good health and well-being throughout your life. Getting enough quality sleep at the right times can help protect your mental health, physical health and quality of life. If you have difficulty falling asleep at night, there are a number of things you can try that may help. 1. Try, as much as possible, to have a regular bedtime as this helps to set your internal body clock. 2. Create a restful sleeping environment. Your bedroom should be neither too hot, nor too cold; and as quiet and dark as possible. 3. Create a good sleep environment by removing TV’s and technical devices from your bedroom. 4. Make sure your bed is comfortable. It’s difficult to get deep, restful sleep if it’s too soft, too hard, too small or too old. 5. Try to relax before going to bed with a warm bath. Adding a few drops of lavender oil to the water may help you sleep better. Spraying your pillow or bedding with a slumber mist can also help you to relax and unwind at bedtime. Click here to discover our Lavender and Chamomile Slumber Mist. 6. Take more exercise. Regular, moderate exercise such as swimming or walking can help relieve the day’s stresses and strains. But not too close to bedtime as it may keep you awake. 7. Avoid caffeine in tea, coffee or cola in the evening. It interferes with falling asleep and prevents deep sleep. Have a hot milky drink or herbal tea instead. 8. Too much food or alcohol, especially late at night, can play havoc with sleep patterns. Alcohol may help you fall asleep initially, but will interrupt your sleep later on in the night. 9. Try wearing bed socks. According to Swiss researchers, you are more likely to fall asleep quickly if your feet and hands are warm. 10. If you can’t sleep, don’t lie there worrying about it. Get up and do something you find relaxing until you feel sleepy again - then go back to bed. 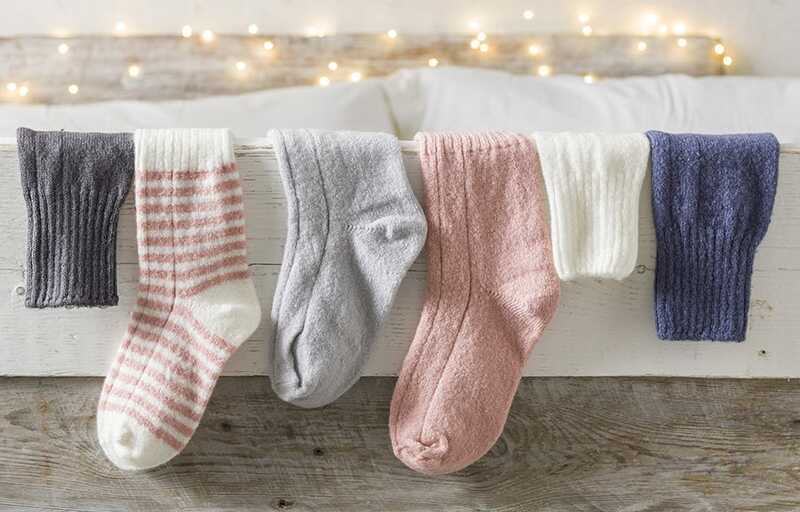 Click here to view our collection of Super-soft Bed Socks.